Are you looking for roofing contractors in Bridgwater? We have been established for 40 years, and in that time, we have installed roofs for many happy customers. Our contractors understand the importance of making your home safe, secure and waterproof. If you need repairs, replacements or a re-tiling service, then make us your first call. We are also affiliated with the National Federation of Roofing Contractors, so you can rest assured that you are receiving the best quality workmanship. Give yourself a stress-free experience by choosing our professional roofing services. You will be saving both time and money, as our trustworthy team can also offer our extensive services for very competitive prices. Always popular choices, our slate and tile roofs will make your property look great. Furthermore, our slate and tiles are extremely durable, long lasting and also require little to no maintenance. If you need GRP flat roofing, our experts are on hand. Our fibreglass flat roofs are made with the best waterproof material that will protect your building from the elements. Our roof repair and replacement service can help fix any damage. Whether you have leaks or broken tiles, call our specialists today to make your home safe, secure and watertight. Looking for Roofers in Bridgwater? We are roofers in Bridgwater who have been helping our customers maintain and repair their homes for 40 years. 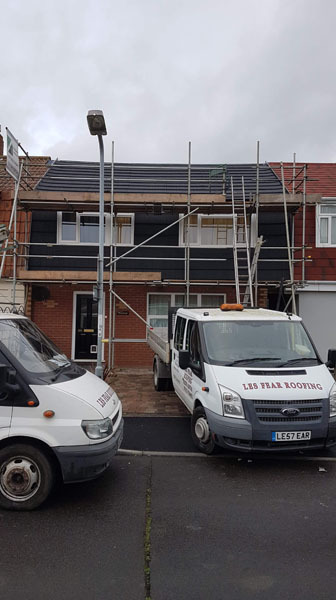 Working throughout our local area, Les Fear Roofing has built up a reputable name as a roofing company that you can trust. We complete every job to our clients’ satisfaction, as we will always communicate our progress to you throughout the project. If you require our comprehensive services, get in contact with our friendly team today for a free quotation.